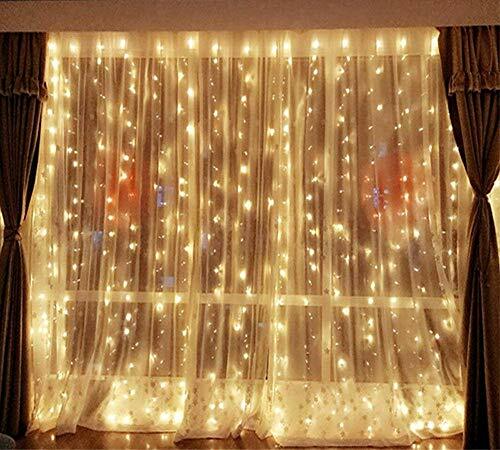 Beautiful Curtain Lights of Warm White Lights popularly used for party, wedding, home, window, bathroom, shows, restaurant, hotel, commercial building, shopping center, shopcase, pub, club,concert, hall, cabaret, fashion show, dance, stage, christmas tree, etc. 8. The controller has 8 different lighting modes:combination, in waves, sequential, slogs lo, chasing/flash, slow fade, twinkle/flash, and steady on. Hanging them up first and then unraveling each individual strand, it will be easy. When you hang it don't undo the strands of lights until you have the main wire up and ready. This will save you a lot of headache because it will tangle easily. Also, when you have to take it down you can wound up each strand and taped it up to avoid tangles and make it easier for use next time. If you have any questions about this product by DLPIN, contact us by completing and submitting the form below. If you are looking for a specif part number, please include it with your message.